Auto- Route for cars. The route contains asphalt and gravel road. The length of the route is 53 km. The start of the route is Anykščiai Regional Park visitor centre, here we offer you to visit an interactive exposition about Anykščiai. From Anykščiai Regional Park visitor's centre drive along J. Biliūno street, then turn left. Go straight accross the river Šventoji, keep to the left. 2.2 km away you will see the link towards the Puntukas Stone. Go along the gravel road approximately for 700 metres. then turn left. 500 metres away leave the car in the parking lot and walk to the brother of Puntukas. From the car park go back, in the T form crossroad turn left, then after 1.4 km turn left. After 700 metres turn left and go straight for 500 metres. At the information stand leave the car and go down to the "Queen's quagmire". After going back 500 metres turn left and go straight. Leaving Ažuožeriai behind turn left. After 5 km you will see the direction to the Vetygala Exposure. Then go on back on the main road and you will see on the left side of the road the houses of the birds. Turn left, then go straight and then you will reach Daumantų exposure. 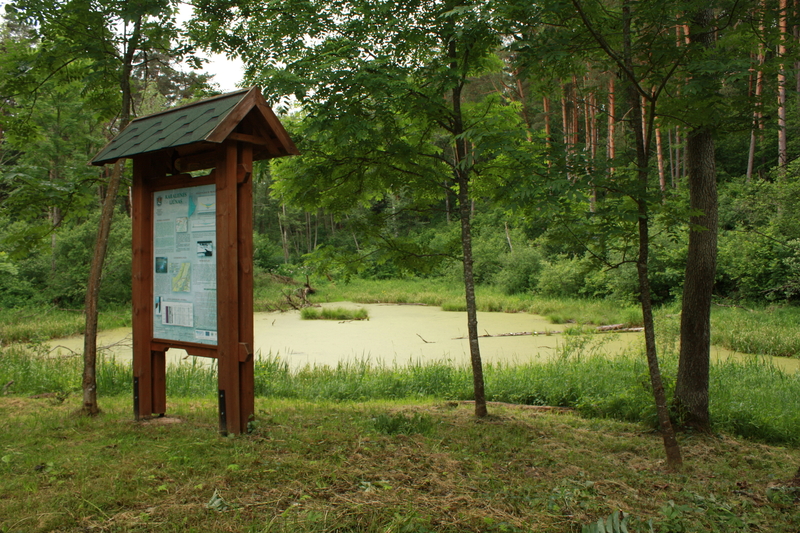 After visiting Daumantų exposure, go back to the main road and drive towards Kavarskas. Go straight through Kavarskas. Leaving the church behind you will see the link towards the spring. When you visit the spring, go back until the direction to Kurkliai. Turn right and cross the river bridge. After going along 4.5 km and leaving the bus stop behind turn right. Go straight for about 3.3 km. When you reach the asphalt turn right. 3.3 km away you will see the direction to Puntukas stone. After visiting The saint Oaks and The Treetop Walking Path and the Puntukas stone, go back to the main road and drive to Anykščiai. In the round-about take the first exit and go straight. After 1.3 km T form crossroad turn left, then turn right. Drive straight and after about 1 km - the end of the route - ARP visitor centre.